It is going to be difficult to top this one in 2012. 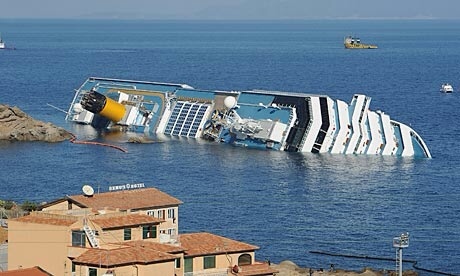 Francesco Schettino, the captain of the stricken Costa Concordia, answering the charge that he abandoned his ship before seeing to the safety of his passengers, is quoted today as claiming that he “tripped and fell into a lifeboat”. Poor man. The only alternative left to him after this cruel trick of fate was to direct operations from shore. ~ by Garry on January 19, 2012. Dad and I fell about laughing when we heard that on the radio. What a pathetic excuse. Kevin and I also laughed for days about this comment…….did he really think anyone would buy that???? ?